SPAIN, Caesaraugusta. Gaius (Caligula). AD 37-41. Æ As (30mm, 11.52 g, 6h). Licinianus and Germanus, duoviri. Laureate head left / Founder plowing right with yoke of oxen. ACIP 3100a; RPC I 371. Joe Geranio Collection, anyone may use as long as credit is given. Caius Caesar was born in 12 A.D., the son of Germanicus and Agrippina Sr. He was nicknamed Caligula, meaning "little boots," by the legions because as a child his mother dressed him in military uniforms (including little boots). Initially he was very popular, succeeding Tiberius in 37 A.D. and for a few brief months ruling very well. However, an unknown disease drove him mad and his reign soon degenerated into debauchery and murder. He was murdered by the Praetorian Guard in 41 A.D.
Joe counting hair curls, pincers, etc.......... from profile. 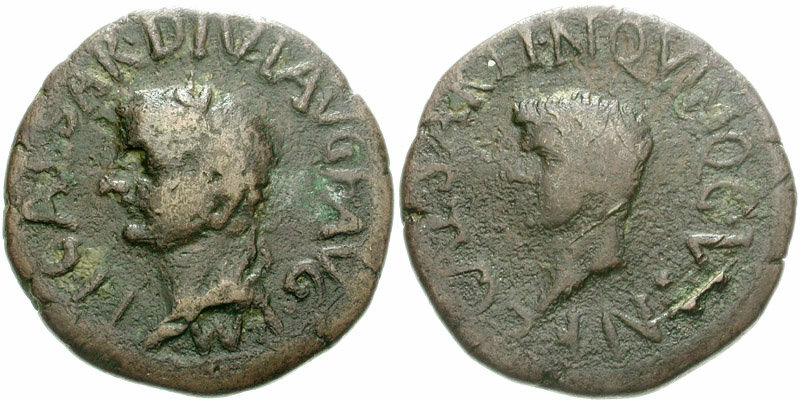 The Gettty Caligulan head is fantastic for showing agreement on Caligula' Vesta aes (bronze coins). See example below. 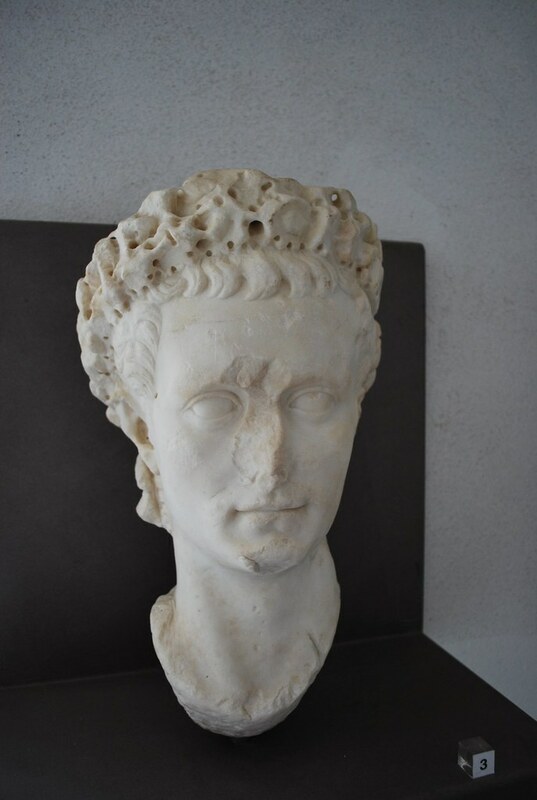 Remember; these portraits are found without inscribed statue bases if that was the case and numismatics are the key for helping ID these wonderful Julio Claudian portraits. 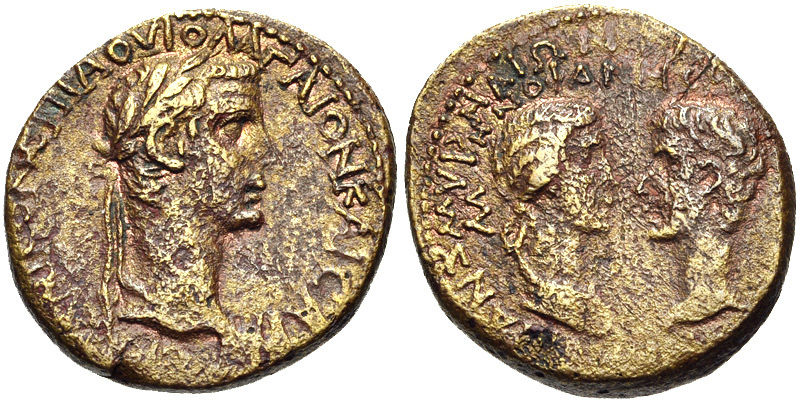 The only thing I love more than collecting Julio Claudian coins is identifying portraits in the round, but you can't do that without numismatics. 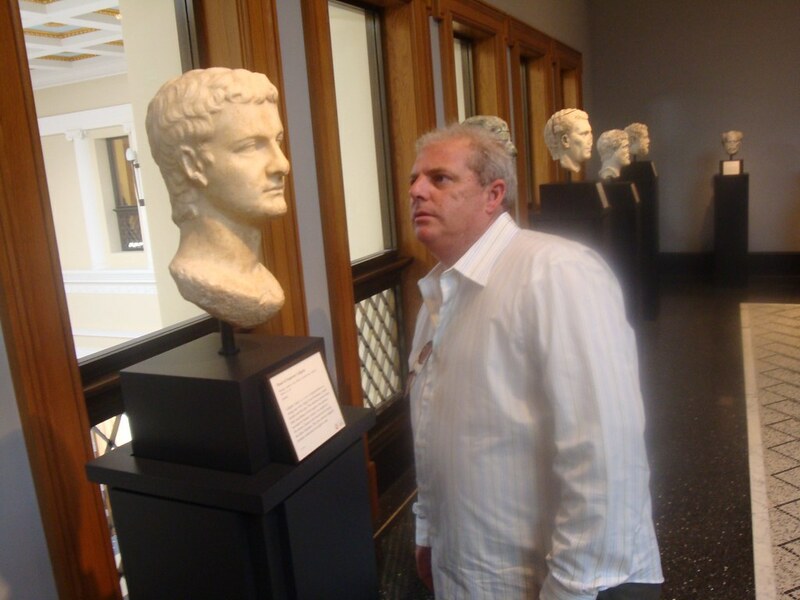 This is about 20 years ago when I first became interested in Julio Claudian Portraiture. My Julio Claudian buds and myself drove 400 miles; studied the portraits and then drove home and went to work on about 2 hours sleep!! We really knew how to roll!! After many years of civil war, Augustus took complete power in Rome in 27 B.C. He claimed that he was re-establishing the Roman Republic, but he actually founded the Roman Empire. Visual signs emphasizing its power and legitimacy bolstered this new political order. 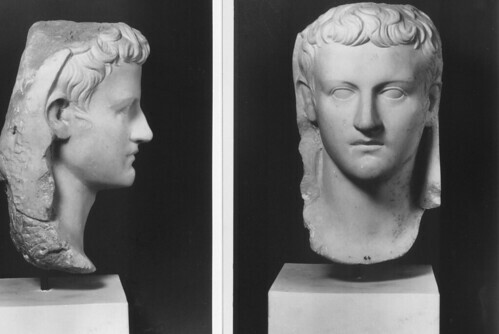 Portraits of Augustus served as symbols of his political agenda rather than corresponding to his physical features as described in written sources. Augustus is always shown in an ideal, classicizing style, and he never ages over the length of his reign. One constant feature of Augustus's portraits is his hairstyle, with its distinctive forked locks of hair on his forehead. Forum, southern portico at Cumae. White marble of greek provenance (thasian? ); Cumae, Italy. Museo Archeologico dei campi flegrei, Bacoli, Italy Photo by my friend Rien Bongers. For more on this portrait see: D. Boschung's, "Die Bildnisse des Caligula" (1989). Page 117 for description and plates 33 1 thru 4. GAIUS CALIGULA.. 37-41 AD. Æ As (10.72 gm). Struck 37-38 AD. C CAESAR AVG GERMANICVS PON M TR POT, bare head left / VESTA above, S C across field, Vesta seated left, holding patera and sceptre. RIC I 38; BMCRE 46; BN 54; Szaivert 9-6; Cohen 27. Joe Geranio Collection- Can be used if credit is given. Gaius (Caligula). AD 37-41. Æ As (28mm, 11.11 g, 6h). Rome mint. Struck AD 37-38. Bare head left / Vesta seated left on throne, holding scepter and patera; c/m: TIB CLA IMP (ligate). RIC I 38; for c/m: Pangerl 51. Joe Geranio Collection. PHOENICIA, Tripolis. Gaius (Caligula). AD 37-41. Æ 21mm (8.84 g, 12h). Date CY 350 (AD 38/9). Laureate head left; L NT (date) below chin / The Dioscuri standing left, each holding wreath over pileus resting on ground and scepter. RPC 4519.15 (this coin); SNG Copenhagen -; BMC 38. Joe Geranio Collection- Anyone may use if credit is given. KINGS of BOSPORUS. Aspurgus, with Gaius (Caligula). AD 14-38. Æ 12 Unit (25mm, 9.56 g). Struck AD 37-38. Bare head of Caligula right / Diademed head of Aspurgus right; monogram and IB in fields. MacDonald 302; RPC I 1904; Anokhin 320. Joe Geranio Collection- Anyone may use as long as credit is given. IONIA, Smyrna. Gaius (Caligula), with Germanicus and Agrippina Senior. AD 37-41. Æ 21mm (6.42 g, 12h). Menophanes, magistrate, and Aviola, proconsul. 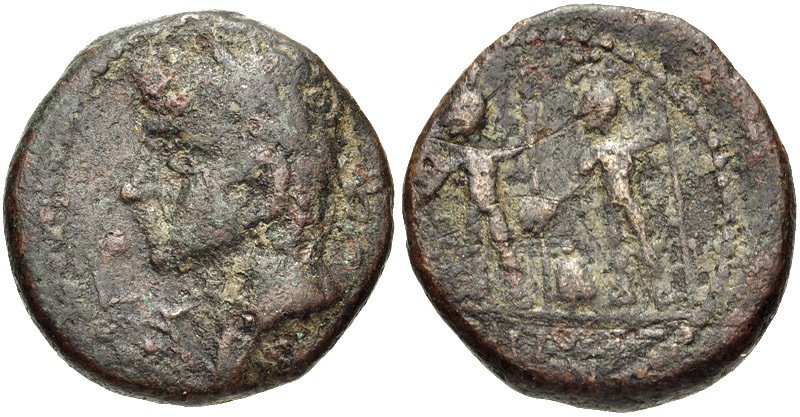 Struck circa AD 37-38. 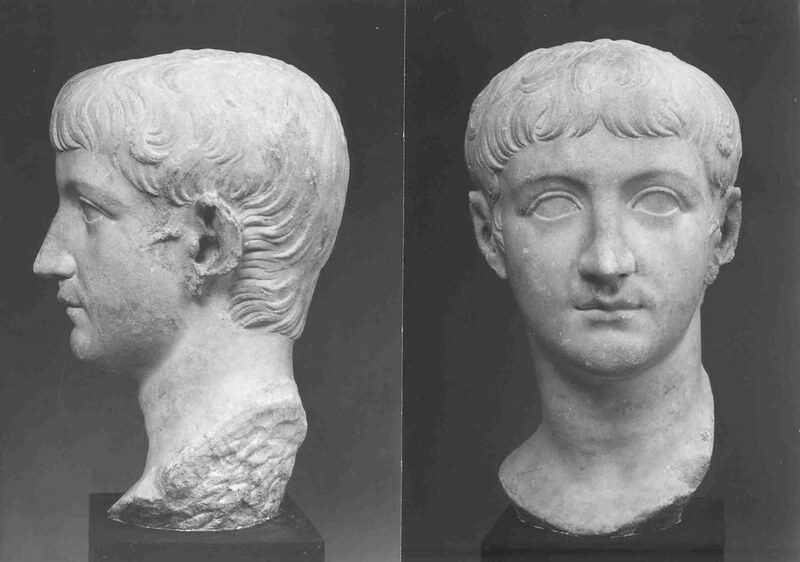 Laureate head of Gaius (Caligula) right / Draped bust of Agrippina I right, vis-à-vis bare head of Germanicus left. RPC 2471; Klose XXIX, SNG von Aulock 2201. Joe Geranio Collection- Anyone may use as long as credit is given. Gaius (Caligula). AD 37-41. Æ “Medallic” Sestertius (30.30 g, 7h). Rome mint. Struck AD 37-38. Pietas seated left, holding patera and resting arm on small draped figure standing facing on basis / Gaius standing left, holding patera over garlanded altar; victimarius holding bull for sacrifice and attendant holding a patera standing on either side; garlanded hexastyle temple of Divus Augustus in background; pediment decorated with sacrificial scene; quadriga and Victories as acroteria; statues of Romulus and Aeneas along roof line. RIC I 36. SPAIN, Terraconensis. Carthago Nova. Tiberius, with Gaius (Caligula) as Caesar. AD 14-37. Æ 18mm (4.46 g). 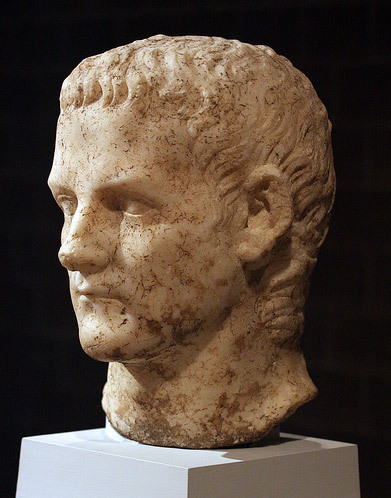 Laureate head of Tiberius left / Bare head of Gaius Caligula left. RPC I 184. For problems with the dating of Tiberian Coinage see RPC and A. Banti and L. Simonetti, Corpus Nummorum Romanorum (XIII Florence: 1977 pp. 141-50 deal with dating to 34 A.D. (PolliniJWAG, note 28 for more explanation. Also: "Aspects of the Principate of Tiberius", Historical comments on the Colonial coinage issued outside Spain, Michael Grant- The American Numismatic Society - Numismatic Notes and Monographs(1950) There are some issues with inscriptions and dating in Banti Simonetti. 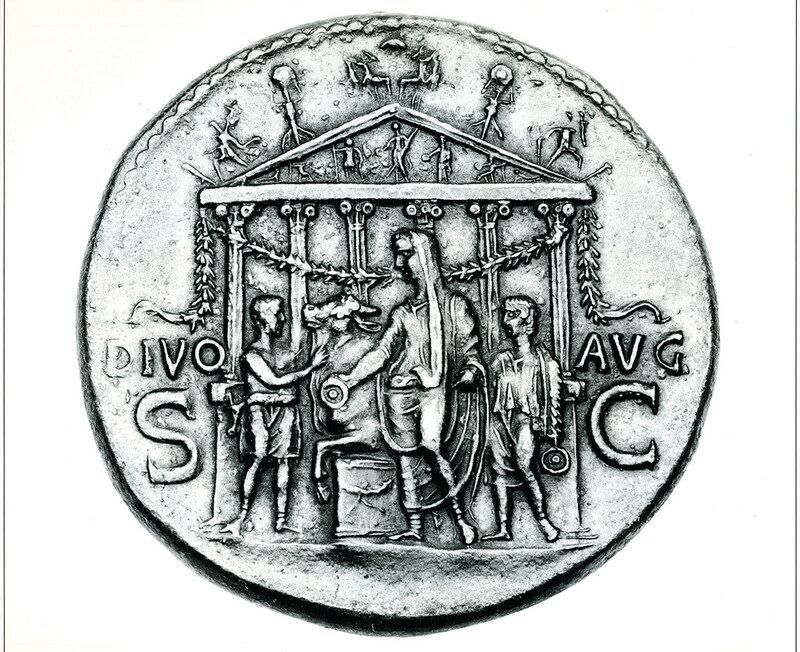 Full Record: Gainor, John R. The image of the Julio-Claudian dynasty from coins / by John R. Gainor. Full Record: Gomis Justo, Mariv�i. Ercavica : La emisi�on de Cal�igula. Estimaci�on del n�umero de cu�nos originales. Full Record: Catalli, Fiorenzo. Le thesaurus de Sora / Fiorenzo Catalli et John Scheid. Full Record: Giard, Jean-Baptiste. Faux deniers de Caligula de la Renaissance. Full Record: Cortellini, Nereo. Le monete di Caligola nel Cohen. Full Record: Guey, Julien. Les "bains d'or" de Caligula "Immensi Avreorvm Acervi (Su�tone, Cal., 42,3). Full Record: Guey, J. Les "bains d'or" de Caligula : Su�tone, Cal. 42, 3. The Very, Very Rare Caligula Quinarius!! Photo sent to Joe Geranio. I have yet to see one in person - Joe Geranio. Average well preserved Denarius weight 3.37 grams. 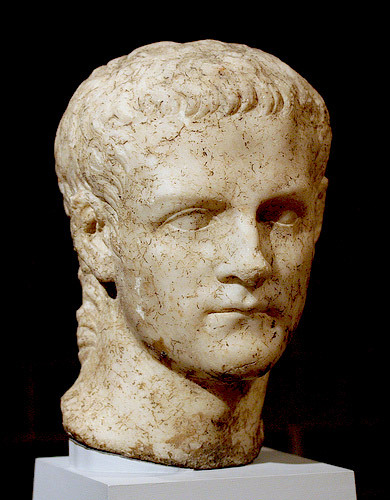 Caligula, the grand nephew and murderer of Tiberius, most worthy to succeed that emperor, because of an equally infamous, though not so able a tyrant, reigned from A.D. 37 to A.D. 41. His real appellation was Caius Caesar, but about the time of Augustus' death, he, still a child, being with the army of the lower Rhine, the soldiers, with whom he was a great favorite, were accustomed in the joking parlance of the camp, to give him the nickname of Caligula (from Caligae) because he constantly appeared in the usual military leggings. Caesar Successit, saevo saevior ingenio. As emperor, however, he was always called Caius, and he considered himself insulted by the name of Caligula. 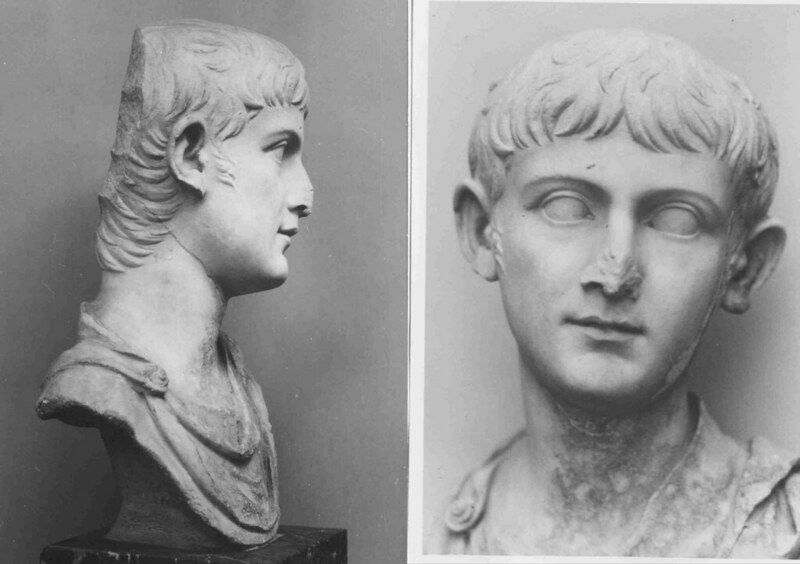 He was the youngest son of Germanicus, the nephew of Tiberius and Agrippina; born in 12 A.D. on the day before the calends of September, at Antium, as Suetonius has proved at great length (in Caligula, ch. 8). In 17 A.D., he went into Syria with his father, at whose death, within two years, he returned to Rome with his mother. After she was banished, he was transferred to his great grand-mother Julia and when she diet to his grand-mother Antonia. In 31 A.D., after the violent deaths of his brothers Nero and Drusus, and also of Sejanus, whose plots he alone had escaped he was he was the apparent successor to the empire and invested with the Pontificate. In 37 A.D., Tiberius was attacked with a severe illness from which he was recovering when Caligula, at the instigation of Maero, the praetorian prefect, put and end to his life by smothering him. Caligula entered Rome after Tiberius' death and compelled the Senate to join him, by a Senatus Consultum, in depriving Tiberius, son Drusus junior and the elder Tiberius' heir in his last will, of his right to the empire. The funeral ceremonies of were performed with due pomp by Caligula. On the eighth month of his reign he was attacked with severe sickness. On his recovery, he adopted his brother Tiberius, gave him the title of Princeps Juventutis, and afterwards put him to death. In the calends of July he entered upon the office of Consul Suffectus, as colleague to his uncle Claudius, and after two months resigned it. In 38 A.D. he conceded to Soaemus, the kingdom of Arabians of Ituraea; to Cotys, Armenia Minor; to Polemon, the son of Polemon, his father's dominions. 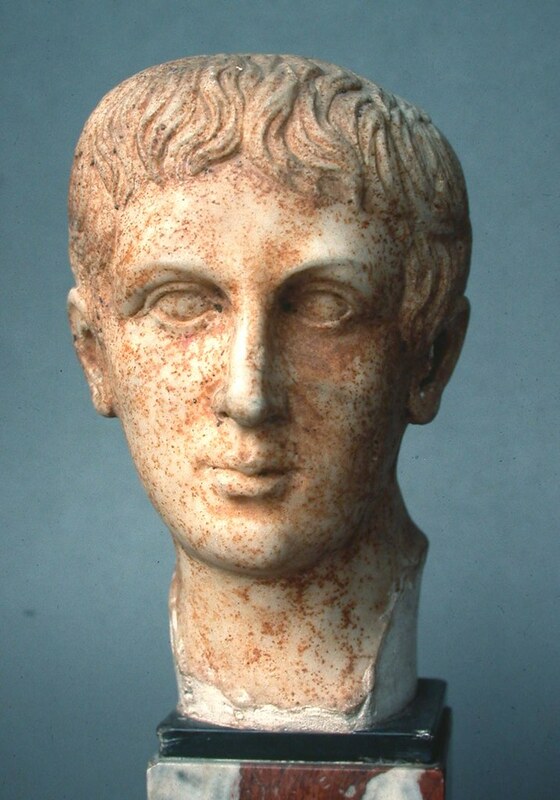 Dion wrote, "In a short time he assumed so much the air of a king, that all those honors, which Augustus had accepted only when duly arrived at the sovereignty, and even then with hesitation as they were decreed from time to time, and many of which Tiberius altogether declined, were by Caligula grasped in one day, with the exception only of Pater Patriae, which, however was not long deferred." Having exhausted the treasury by his profuse expenditure on public spectacles and other extravagances, he endeavoured to repair the deficiency by the slaughter of wealthy citizens; and then proceeded to Gaul, their to practice the like system of murder and spoliation. The name of Germanicus does not appear on coins of this year, nor ever subsequently. In 41 A.D., he began hid fourth consulate, on the 7th of the ides of January. Shortly afterwards (viz. on the 9th of the calends of February), he was assassinated by the conspirators Cassius Chaerea and Cornelius Sabinus. 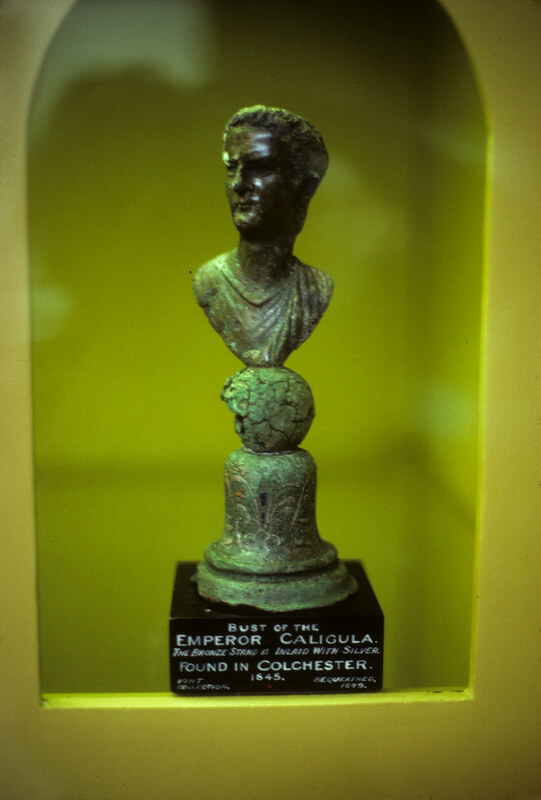 Caligula's accession to the empire was hailed with joy by the Roman people; but their satisfaction was based on no solid foundations, being the result rather of their deep-rooted attachment to his father Germanicus. He seeming, indeed, responded to the fond wishes of the nation, by many acts of piety, justice, and moderation. But it too soon became apparent that these virtues were not of natural growth but owed their exhibition to the policy of Tiberius, who wished through their influences to consolidate his own power in the empire. For there was not act of cruelty, folly, meanness or infamy, which this monster and madman did not delight in perpetrating. He caused his horse, whom he called Incitatus, to be introduced at dinner time, setting before him gilded corn, and drinking his health in golden cups; and he would have created him consul, had he lived long enough. He imitated all the gods and goddesses, in the adoration which he caused to be paid to him, becoming by turns Jupiter, Bacchus, Hercules, Juno, Diana, and Venus. He constructed a bridge of vessels joined together from Puteoli to Baiae, and crossing over with his troops invaded puteoli and then recrossed it in a kind of triumph, delighting in hearing himself called Alexander the Great. By his absurd and extravagant undertakings of this kind, before the year was fully expired, he had squandered the enormous sums of money left by Tiberius. (Vicies ae septics millies IIS. -- See Sestertium). He both claimed and receive divine worship, and was the greatest blasphemer that ever lived; yet he quailed in the conviction of a deity, and crept under his bed whenever he heard thunder. With savage inhumanity he attended executions in person, and made parents behold the merciless torments inflicted on their children. He contracted and dissolved marriages with equal caprice and dishonesty. Besides his incestuous union with Drusilla, he seized and repudiated three wives, and was at last permanently attached to Caesonia a mother of children by another man, and without your or beauty, but of depravity corresponding with his own. Other instances of his incredible cruelty and lust may be found in Suetonius, Philo, and Dion. Such infatuations are evident tokens not only of a brutal nature, but also of a distempered intellect. Nor is it possible to entertain other than supreme contempt for the base servility of the Romans, who could offer solemn adoration to a wretch openly guilty of the most detestable and unnatural crimes; and whose adage was oderint, dum metuant (Let them hate so long as they fear). The gold and silver coins of Caligula are of considerable rarity. Sestertii are also rare. Ases are more common, yet still expensive due to popularity of collecting the infamous emperor and because they generally exhibit good workmanship. When Caligula was destroyed, the dastardly senators, who had so recently sacrificed to him, ordered all his statues to be demolished, his acts abrogated, his money melted down and his inscriptions defaced, in order that his memory might be extinguished forever. Yet this sentence has not prevented a considerable number of his coins from reaching us, though consequently, except for ases, they are of considerable rarity when in good preservation. The coins of Caligula, minted at Rome, do not exhibit Imperator as a surname. This title is used on colonial coins. The only imperial coin of Caligula bearing IMP is a denarius. On his coins, Caligula resembles his grandfather, but is less noble and has a malignant expression. He was at great pains to cherish this horrid index of his cruel disposition.